What are the best 6.75 car speakers? There's so many models out there that it becomes a bit hard to choose. Luckily for you, I've spent more than 100 hours testing models at the shop and I'm confident that I've found top 5 models on this size. So without any further ado, let's see which are my recommendations as the best speakers for cars on 6.¾ inches. 1. JL Audio C3-650 6-3/4"
Powerful enough to use as door speaker replacements or in amplified trunk enclosures. Power draw of 60 watts RMS makes these ideal factory replacement speakers for use with factory car stereos. At 75 watts RMS, these speakers are quite loud, but they don’t sacrifice any clarity or punch that often gets lost in sheet volume performance. They also have an exceptional frequency response, so your music will sound crisp whether it is in the higher or lower frequency ranges. This is a component speaker set, which means that crossovers and speakers all have to be installed individually. Woofers typically get installed in the door enclosures, and then the tweeters and crossover networks have to be wired and installed separately. This can make things a little tricky, especially if your vehicle does not have pre-cut spaces for tweeters in the interior panels. You may also want to consider upgrading your stereo or using an amplifier given the power draw of 75 watts per channel, since not too many car stereos actually push that much power to their original speakers. Besides that, I'd recommend these JL as the best 6.75 car speakers overall. Components must be installed individually, which may be challenging for DIY car audio enthusiasts with limited experience. 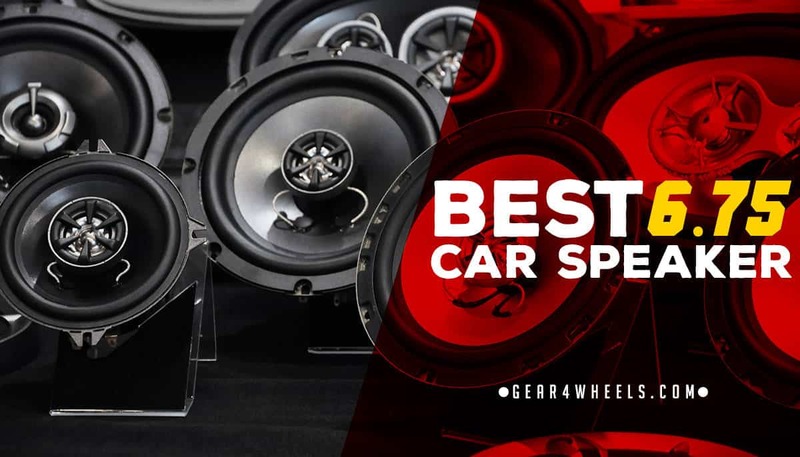 Some owners may want to consider upgrading their factory car stereo for an aftermarket model to get the best performance out of theses speakers. Infinity Kappa manufacturers some of the best sounding speakers money can buy, and the specs on these speakers alone are clear evidence of that. They build them to be powerful, but more importantly they build them to last. Take a look at what makes these speakers a superior upgrade choice. First of all, the frequency range on these speakers is ridiculous. They can throw lows that sound like a contained earthquake, and yet neither he mid range nor the treble gets lost in the boom of the woofers. All that power and clarity draws 90 watts RMS, and they peak at 180 watts, so these speakers are ideal for integrating with a powerful aftermarket amplifier. Honestly, these speakers would make good door speaker replacements or a fine addition to any trunk mounted speaker enclosure. It’s a component speaker set. That means additional work mounting and wiring the tweeters and crossovers. If you are up for it though, these speakers are probably the best option for giving your car stereo a significant upgrade. Speaking of upgrading though, you are going to want to upgrade your factory car stereo if you opt for this speaker set. At 90-watts RMS, they are going to draw more than most factory car stereos can handle. Component speaker system installation requires some skill with tools and at running wires out of sight. Power demands for these speakers really require a powerful aftermarket amplifier to reach their full potential. Whew! Hang on tight, because these Kicker component speakers are pushing big sound without a big price tag. These are among the most powerful replacement speakers you can buy, and their bass performance is legendary. Users who want to add some thicker bottom to their car stereo need look no further. Short of adding a powered subwoofer, these are about as earth shaking as they get. However, thanks to the tweeters and crossover network, the bass never drowns out the rest of the music. At 100 watts RMS and 300 watts peak, theses speakers need some powerful amplification to drive them, so an aftermarket car stereo is going to be a must-have for your upgrade. Installing component speaker sets is also a lot more difficult than coaxial speakers, so be prepared for some tapping and drilling to get everything setup correctly. Rockford Fosgate’s Punch series provides probably the most balanced audio clarity out of most speakers in their class, and the 6 ¾” P1675 lives up to its name. Lower power draw at 60 watts RMS means that these speakers are going to work well with your existing factory car stereo. That does not mean, however, that they sound anywhere near wimpy. These speakers can deliver some heavy lows, rich mid range sound, and crystal clear highs effortlessly. They are tough to beat in terms of overall sound quality. Brackets require modification to mount these speakers correctly, which may intimidate some DIY installers. Honestly though, most of the time “modification” means that you are punching out come tabbed holes or components that were designed to easily modify. There is also the minor issue that these speakers have a higher low-end range than other speakers in their class, which might be noticeable to some listeners, but others might not actually be able to distinguish the difference. Other than these two minor concerns, these are great speakers. Installation brackets may need modification in order to fit these speakers into existing enclosures. Another offering from Rockford Fosgate for the more budget or power consumption conscious, the Prime series delivers radically improved sound without overloading your stereo or your budget. These speakers sound amazing for their size and power draw. They also have excellent midrange performance despite their lack of a third speaker component. They are also extremely easy to install thanks to the included speed clips and wiring. They may not be ground shakers at 45 watts, but less likely to be too much for your factory stereo to handle. I wouldn’t recommend these speakers if you intend to upgrade your factory car stereo later on, as they peak at 90 watts and wouldn’t be ideally suited for aftermarket amplifiers. Lower peak power means this pair of speakers is less likely to be a good choice for use with an aftermarket amplifier or head unit. ​While it may seem like there is a lot to consider when selecting your new car speakers to upgrade your car audio experience, it’s really quite simple. Do they fit? Can my stereo power them? Am I going to be able to install them easily? Aside from these considerations, your only concerns are going to be budget and specs. My personal recommendation is for the Infinity Kappa 60.11CS 6-3/4" component speaker system. Their performance overall is tough to beat, and the sound quality is really out of this world. Sure, you may have to spend a little more time and TLC on the installation process, but the performance in audio quality and power is well worth the effort. If you are looking to upgrade your speakers and your car’s stereo, definitely consider buying Infinity Kappa 60.11CS speakers, and turn every car ride into a musical extravaganza. They are definitely my recommendation for the best 6.75 car speakers for the money. Hi Jack. I’d need to know either the exact model (ideally) or the power of those speakers. The P series (nº4 of this list) can handle up to 120W peak, so I’d say you’re more than sufficiently served with a 4×400 amp if those are the ones you’re using.